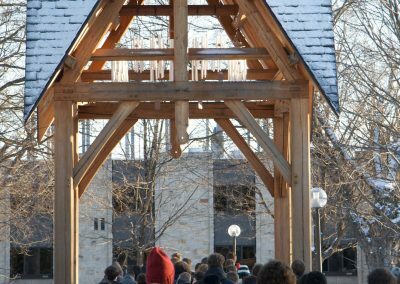 In the wake of the death of St. Olaf College Professor of Religion and Philosophy William “Bill” Narum in May 2000, his family established a fund to honor his belief in community cooperation and to promote integration between faculty and staff. 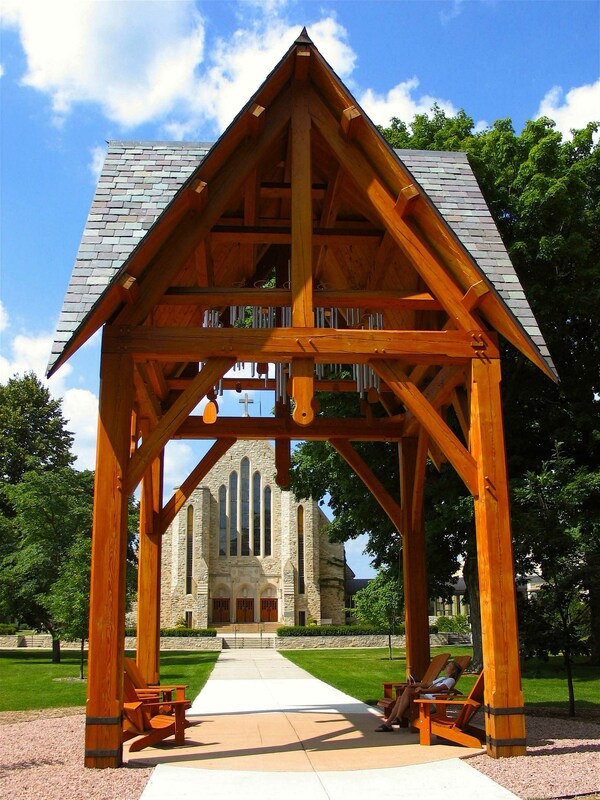 The Wind Chime Memorial Tower, supported by the Narum fund, was designed to encourage the college community to construct a lasting structure commemorating students whose lives were cut short while they were enrolled at the school. 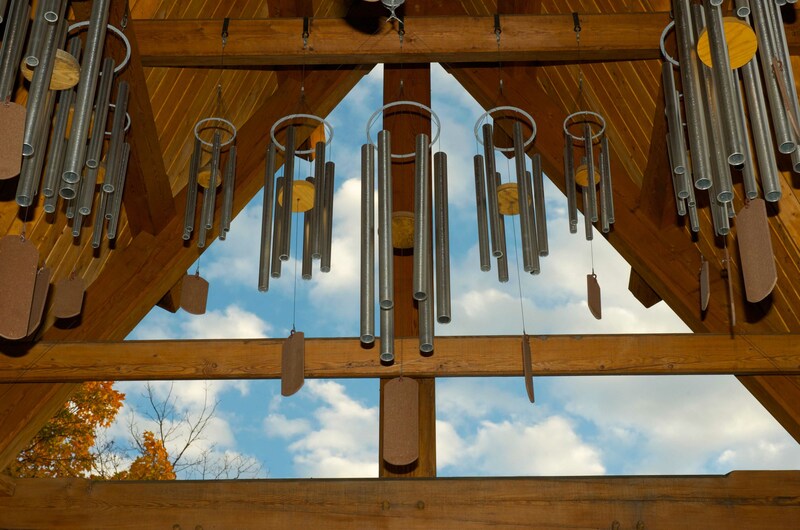 At the time of the dedication on September 28, 2003, 109 memorial wind chimes hung inside the finished memorial, each inscribed with the name of a deceased student. Names were included from the time the college was founded in 1874 to the time of the dedication. 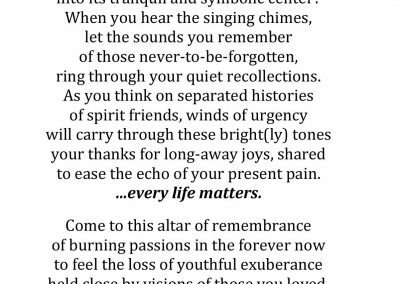 Since then, nine chimes have been added to the tower for those students who have died since or whose names were originally missed. 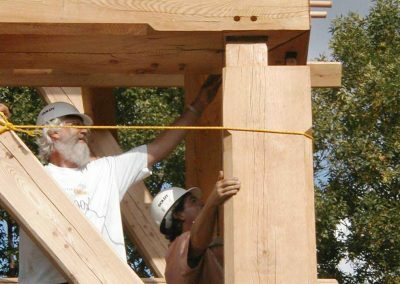 Consideration was put into each phase of the tower’s construction. 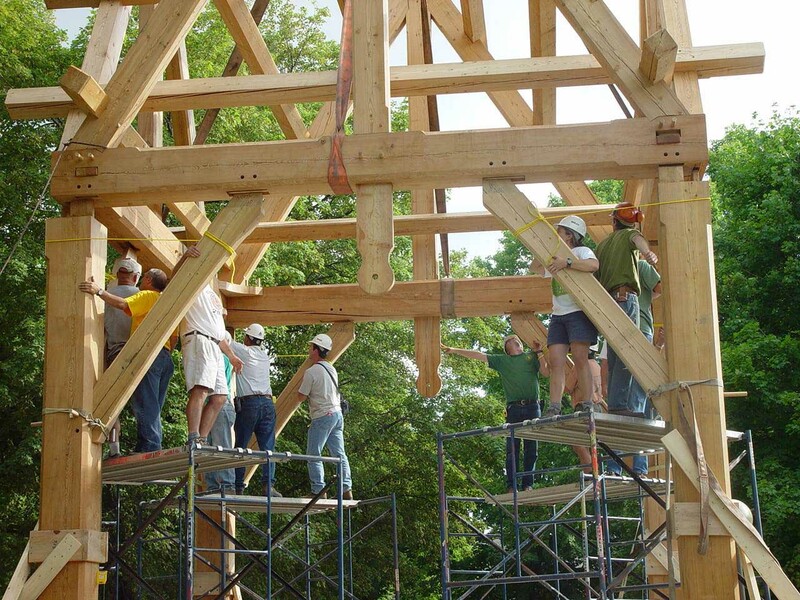 The framing comprises forest salvaged trees that lived their lives and died naturally in place—appropriate for a student memorial. 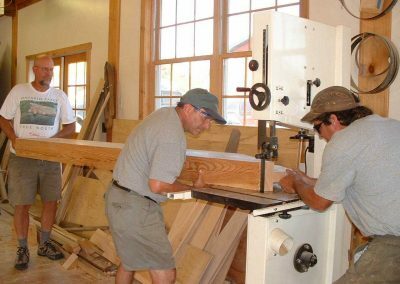 No nails are used; each piece was carefully crafted to allow for support, as each gives and takes a little. 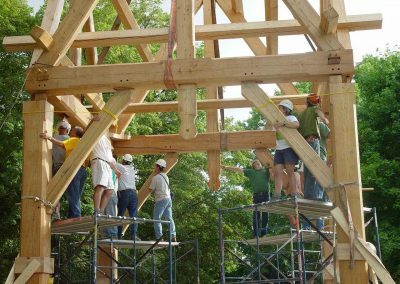 The design resembles a Nordic stave church, recalling St. Olaf’s heritage. 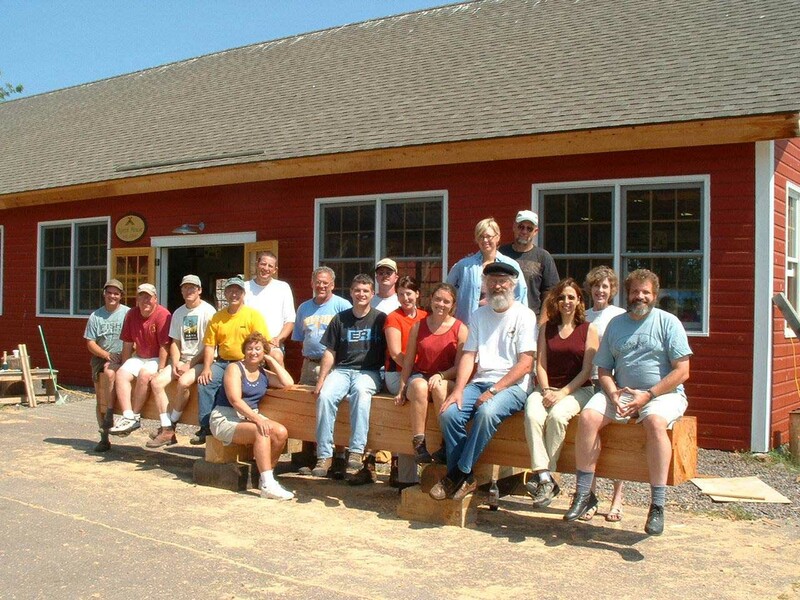 At North House Folk School in Grand Marais, Minnesota. 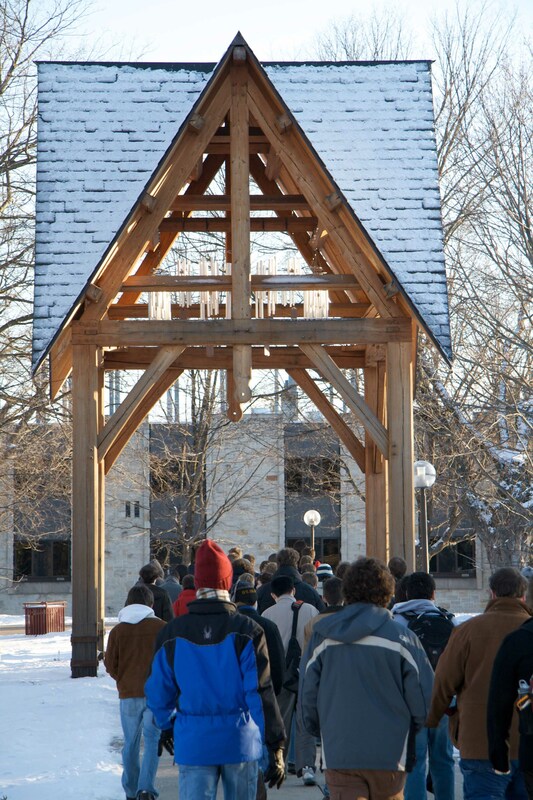 Built by members of the St. Olaf community during the summer of 2003, this Scandinavian-style wooden tower commemorates the lives of students who have died when enrolled at St. Olaf. 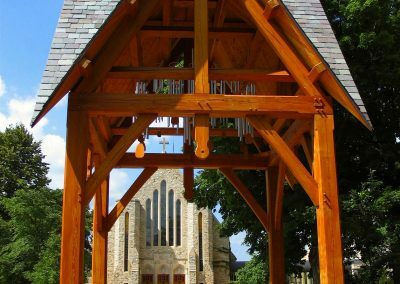 At the time of the dedication on September 28, 2003, 109 memorial wind chimes hung inside the finished memorial, each inscribed with the name of a deceased student from the time the college was founded in 1874 to the time of the dedication. 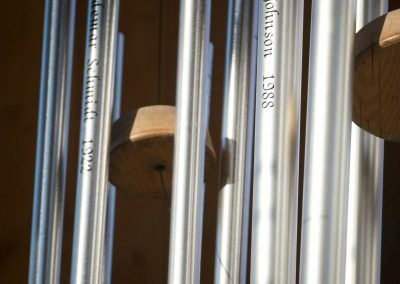 Since the dedication of the chime tower in 2003, nine chimes have been added to the tower for those students who have died since or whose names were originally missed. 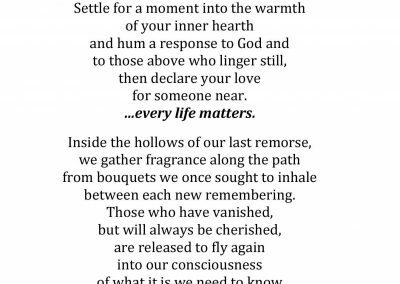 Created to honor the 118 students in the college’s history who have lost their lives before graduating. Professor A. Malcolm “Mac” Gimse, 2003. Professor A. Malcom “Mac” Gimse, 2003. A group of fifteen faculty and staff members traveled to the North House Folk School in Grand Marais, Minnesota, where they took classes in timber framing and built the memorial components. Bruce Benson, then-college pastor, assisting with the installation of the Wind Chime Memorial Tower. 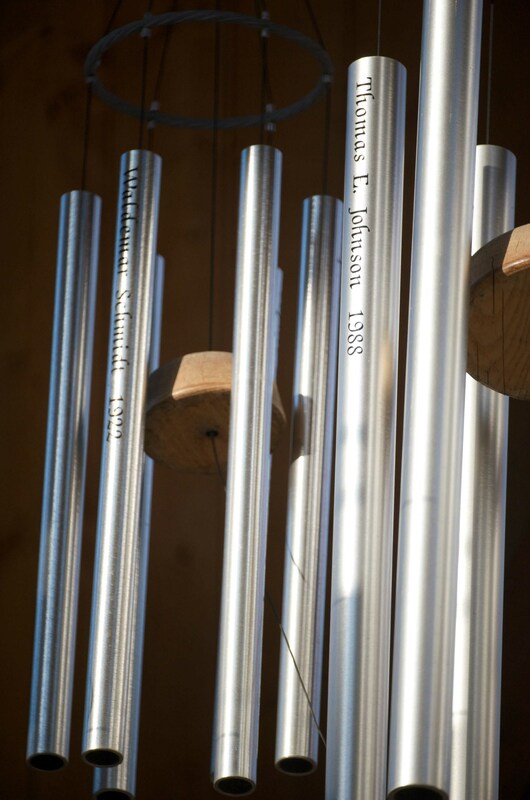 The chimes, tune to the key of D (the key of Beautiful Savior), are engraved with the names of those students. 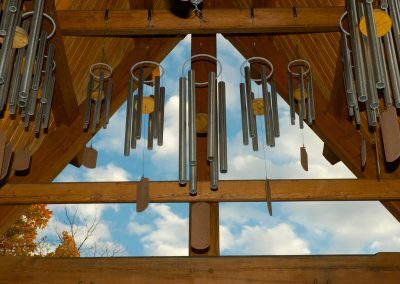 On windy days, the sound of the chimes can be heard almost everywhere on campus. 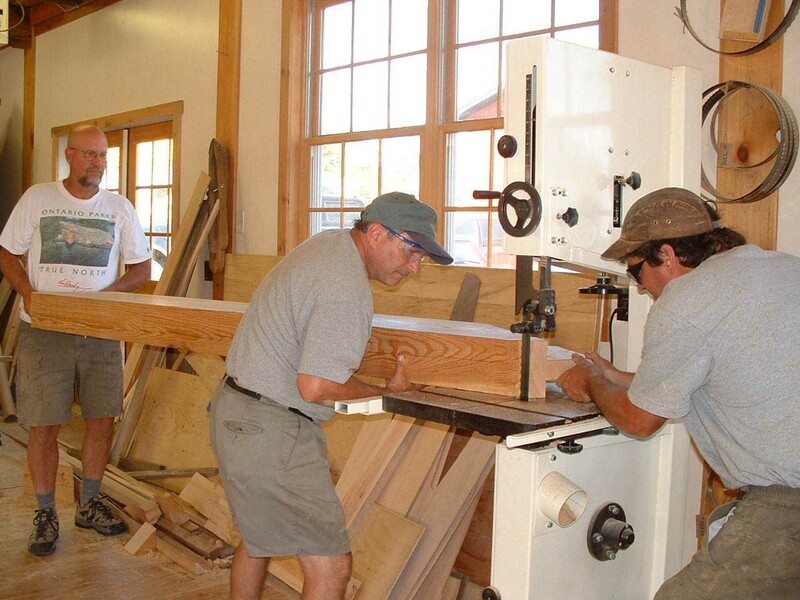 No nails are used for support; each piece was carefully crafted to allow for support, as each gives and takes a little. 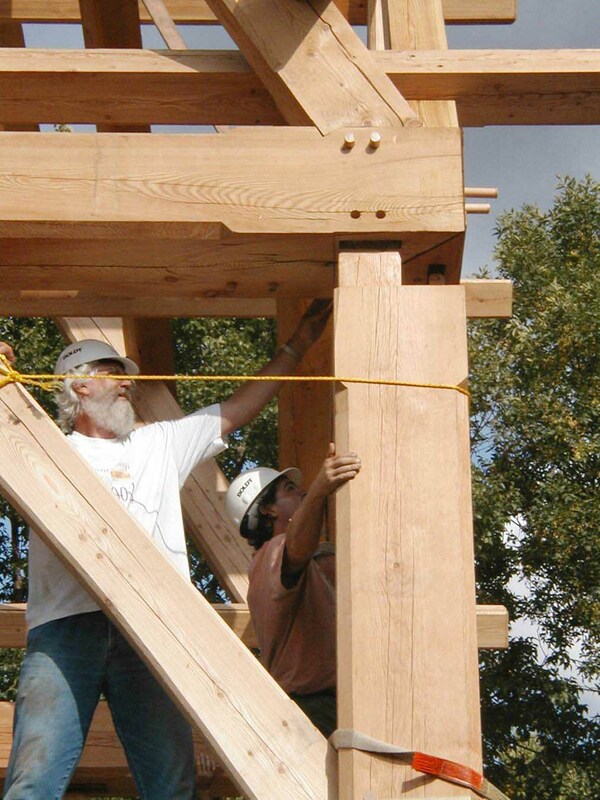 The design resembles a Nordic stave church, recalling St. Olaf’s heritage.